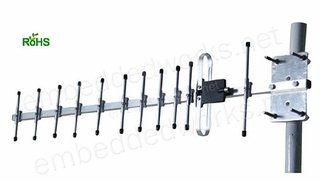 824-960Mhz at 13dB Outdoor Hi-Gain YAGI antenna. Uses include LoRa and LoRaWAN applications operating at ISM 868, 915Mhz freq. for use in USA and Europe. N-type female connector. 820mm length x 125mm x 60mm.